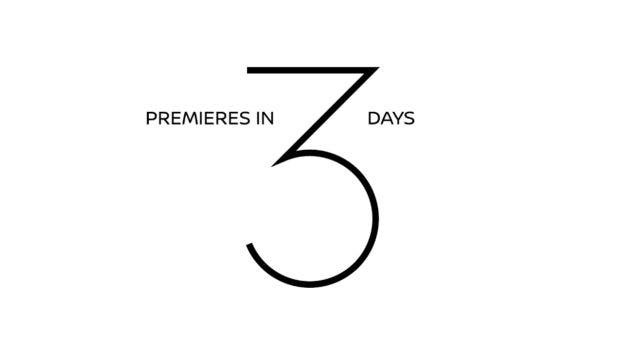 Nissan is set to unveil the highly anticipated 2018 Nissan LEAF on September 5th at 5:30pm Pacific Time | 8:30pm Eastern Time. Steve Hanley and I (Kyle Field) will be livestreaming the event here. If you want to watch along with us, scroll down to the bottom to view the YouTube stream yourself. 5:27 pm Pacific, Kyle Field: Nissan is teasing us with the profile shot of the new LEAF as the event nears. 5:30 pm Pacific, Kyle: We are live! 5:32 pm Pacific, Steve Hanley: Do you remember when the journey WAS the adventure? 5:34 pm Pacific, Steve: Blackout roof for sporty appearance? 5:34pm Pacific, Kyle: The new LEAF is out on the stage! At first glance, it looks a lot like the Faraday Future FF91. 5:38 pm Pacific, Steve: V2G capability — Smart grid — that’s a big deal! SUV styling. Looks nicer than Bolt? More room for stuff than Model 3. Looks a lot nicer than original LEAF. 5:40 pm Pacific, Kyle: This translator is banging out the script at 100 miles per hour. Not sure if the LEAF could even keep up. Phew! 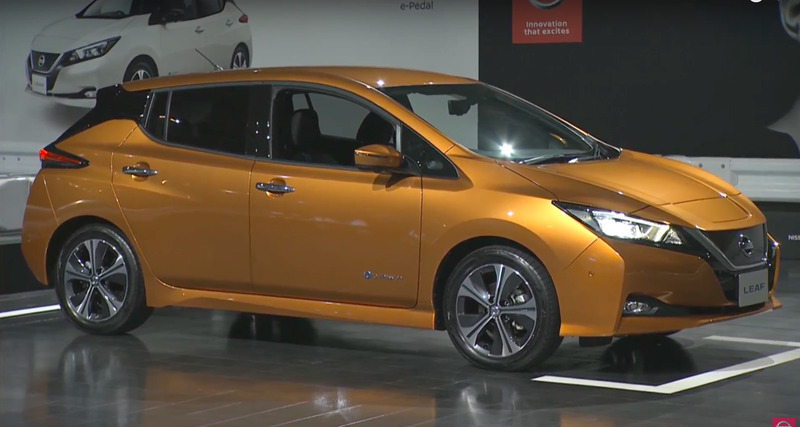 5:42 pm Pacific, Kyle: “The new Nissan Leaf is not an EV.” Instead, Nissan views the LEAF as a transformative step towards the future of mobility. 5:44 pm Pacific, Steve: More than an EV, moving people to a better world and makes their lives better. 5:46 pm Pacific, Steve: Best selling EV in world — sold in 49 markets — 3.5 billion kilometers driven. 5:47 pm Pacific, Kyle: Over 5,300 viewing the stream live on YouTube. Nissan starts talking ProPilot, its autonomous driving technology suite. 5:49 pm Pacific, Steve: ProPILOT — includes self parking and parking in garage. E-pedal has hill holder feature — true one-pedal operation. 5:52 pm Pacific, Steve: Emergency front collision braking. 40 kWh battery, 110 kW motor. 5:56 pm Pacific, Kyle: The two-tone roof cuts the visual height of the vehicle. The new stance gives the new LEAF a low, sporty character. 5:57 pm Pacific, Kyle: The cockpit of the new LEAF looks very similar to the first-generation LEAF. Curious if Nissan changed anything significant inside. 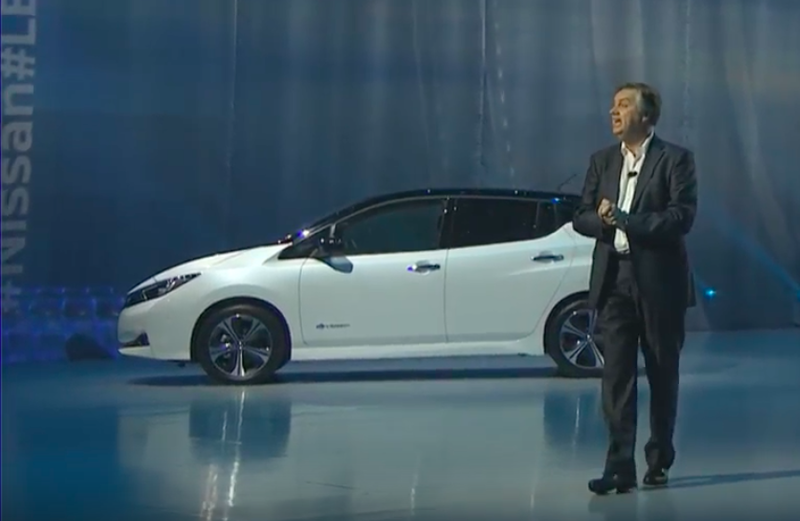 5:59 pm Pacific, Kyle: Nissan now talking about sales expectations and volumes. 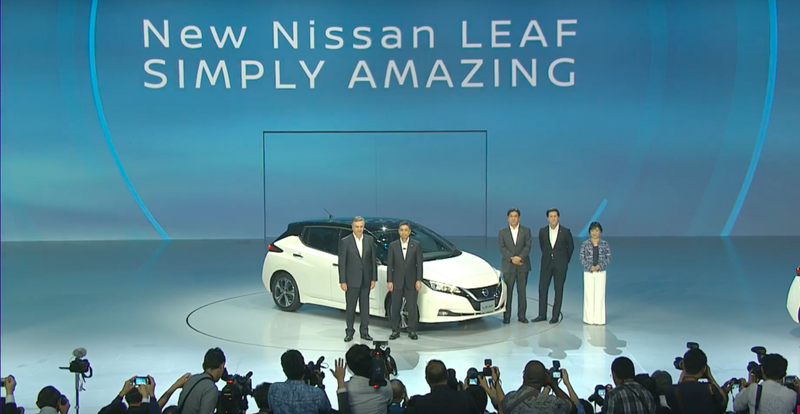 6:00 pm Pacific, Kyle: Nissan will make the new LEAF available in its home market in Japan first. Will be available starting October 2nd! 6:01 pm Pacific, Kyle: The average LEAF driver in Japan will only have to charge the EV once. 6:02 pm Pacific, Steve: Price comparable to current LEAF. Big news! 6:03 pm Pacific, Kyle: Event coming to a close. Wrapping up with the new Nissan LEAF commercial. 6:04 pm Pacific, Steve: Larger battery and higher-power motor in 2018. 6:05 pm Pacific, Kyle: That’s a wrap! The full Nissan team is coming on stage for one last photo. The new 2018 Nissan LEAF website is live with new graphics and vehicle specs on the Nissan USA site.